DS9 borrowed traits from past characters, but still created fresh, interesting, and distinct characters of its own. Deep Space Nine similarly takes elements from popular characters in both the Original Series and in TNG, and mixes them up into its cast. Jadzia (by way of the Dax symbiont) has wisdom beyond her years, and so acts as both the logical scientists (a parallel to Spock and Data), but is also the bro friend of the Captain Commander (like Dr. McCoy was to Kirk). And she also gets to be a flirt like Riker. Odo is the outcast alien who finds a surrogate family (like Spock and Worf) and is a hard-nosed cop (borrowing elements from Tasha Yar). 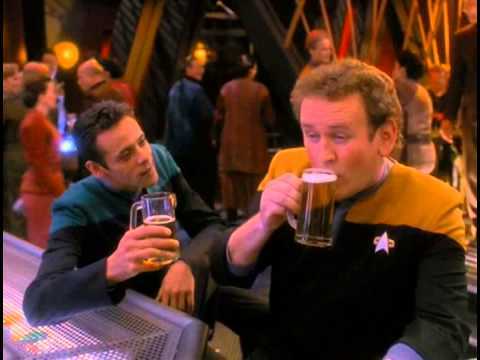 Quark gets to be a pure comic relief character who is the focus point of many fish-out-of-water jokes (like Spock, Worf, and Data were), and (being a bartender) listens to the other characters' problems (like Guinan). Jake and Nog both get to be the prodigal sons (like Wesley), but both go in the opposite directions as expected. Even though a lot of character traits are recycled, the individual characters themselves still feel unique and fresh. 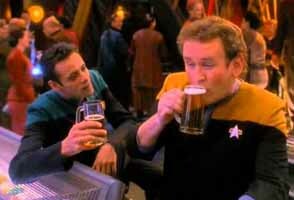 O'Brien is perhaps the most painfully derivative character on DS9. 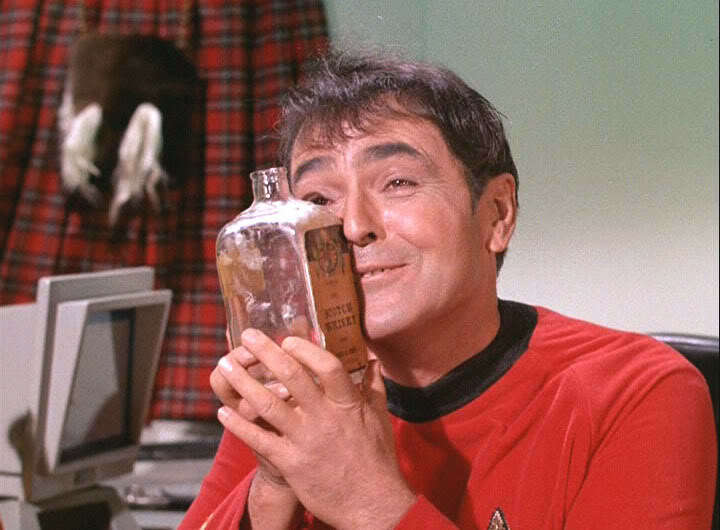 Basically Scotty, but Irish instead of Scottish. I still like him though! 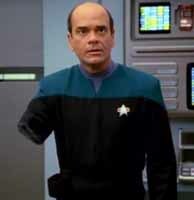 Voyager, on the other hand, more directly copies previous characters but adds a simple gimmick. 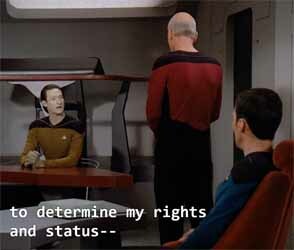 The Doctor is basically just Data again, except he's a hologram this time who can be turned on and off at the crew's whim. 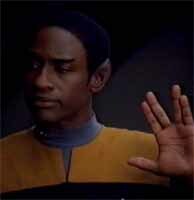 Tuvok is just Spock again, but without the internal conflict of being half human. B'Ellana is just a gender-swap of Worf, except without Worf's rigid discipline to keep her temper in check. 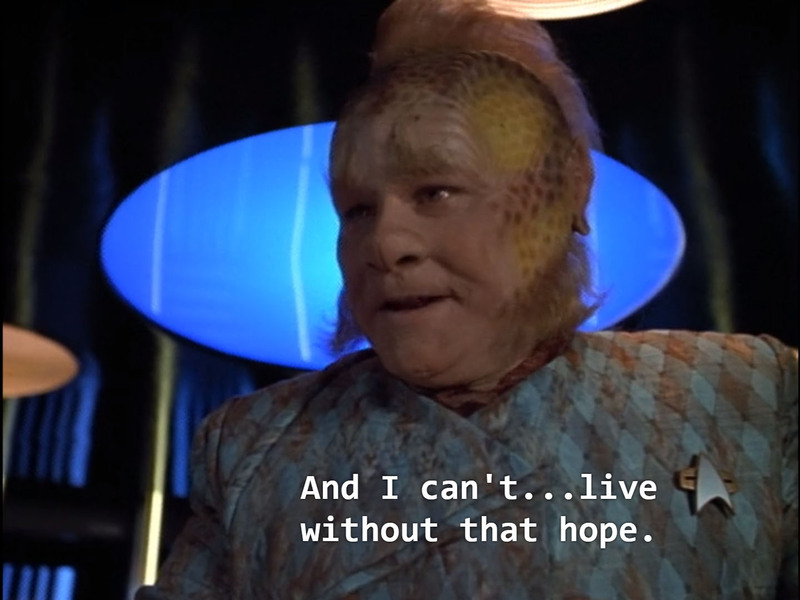 Neelix is just Quark again, except without being the hyper-capitalist caricature, and with a furry face instead of big ears. 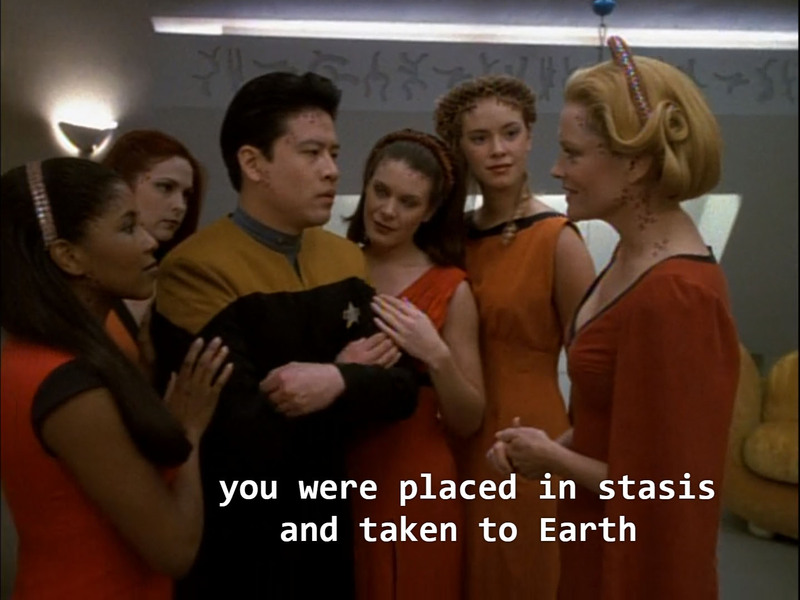 Kes is just Wesley again, but she has her on-again-off-again boyfriend (Neelix) coddling her instead of her mother. These characters aren't necessarily bad characters. They just feel very derivative, and since they don't develop much (if at all) over the course of the show, they also become very stale by the end. interesting character in the series. It isn't until Seven of Nine shows up that we get a truly dynamic and fresh character, who even manages to liven up some of the other characters. She's also a perfect example of how Voyager gets its other characters wrong. 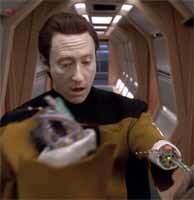 Seven has a lot of parallels to Data. She's a cyborg (which is sort of an artificial life form?) and is trying to become more human. But she isn't just "gender-swapped Data". Her personality, attitudes, and the process of her humanization are completely different to Data. Stories about her do not mirror stories about Data (like so many of the Doctor's episodes). Haven't we seen this story before? 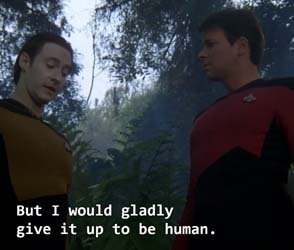 If copying characters weren't bad enough, Voyager also occasionally pulled storylines and concepts straight out of TNG. The easiest example of this is probably the episode "Author, Author", in which the Doctor has to fight for his legal right of ownership over art that he has created. This episode starts off feeling fresh and interesting, by being about the Doctor's fictionalized perspectives of the crew, but it eventually just turns into "The Measure of a Man" again. 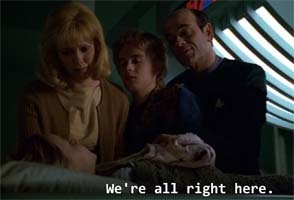 Then there's episodes like "Real Life", which is a near-complete rehash of TNG's "The Offspring". 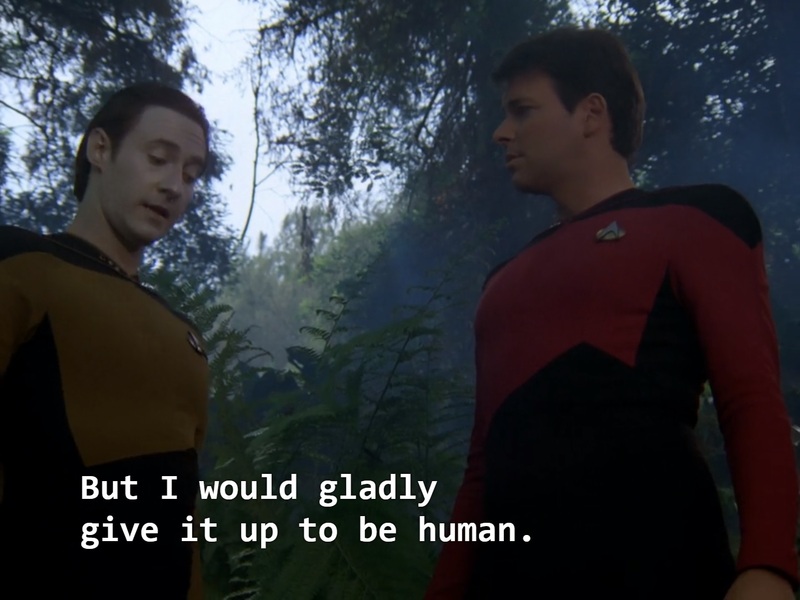 Or "Spirit Folk", which mimics TNG's "Elementary, Dear Data". 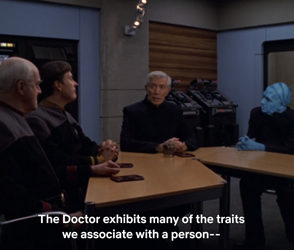 Or how about "Tinker, Tailor, Doctor, Spy", and "Human Error", which are both holodeck obsession episodes that mirror each other, and are also both derivative of TNG's "Hollow Pursuits". And also "Mortal Coil", which feels like it's just borrowing ideas from TNG's "Ethics" and DS9's "Life Support" and "Hard Time". 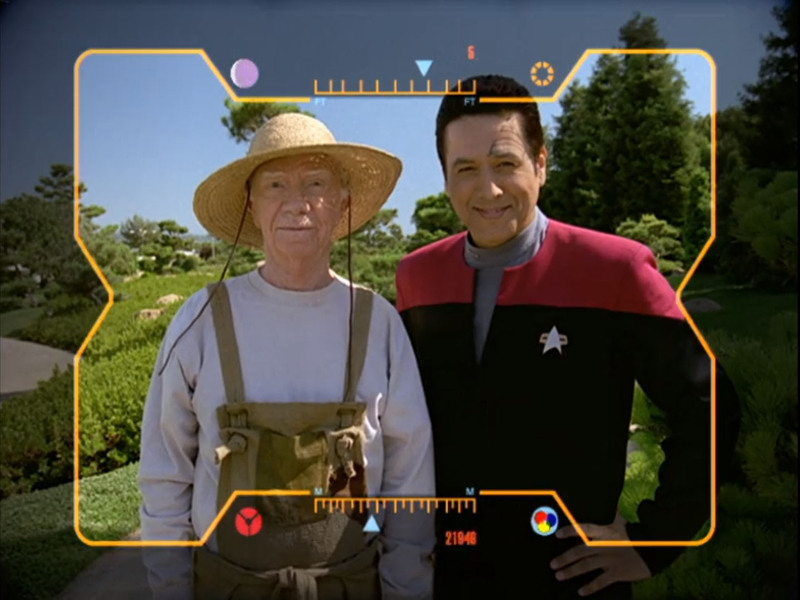 ... and "Real Life" (TNG's "The Offspring"). "Mortal Coil" at least deserves some credit for covering completely different themes than the suicidal episodes that precede it. "Ethics" and "Life Support" were about contemplating euthanasia when quality of life is too low, and "Hard Time" is about crushing guilt. "Mortal Coil" on the other hand, covers religious subject matter, depression, and metaphysics. 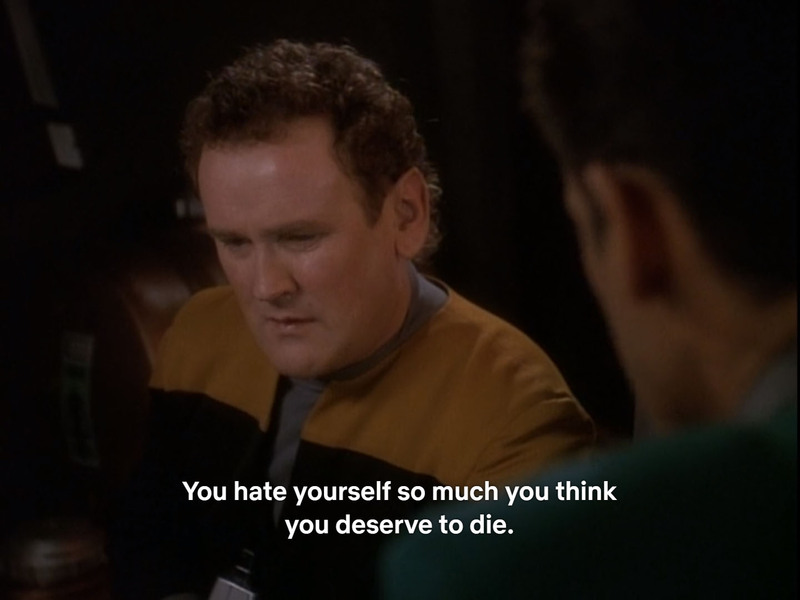 Even so, Chakotay's "Life is worth living" speech still comes off as echoing Bashir's "You don't deserve to die" speech from "Hard Time", and the climax to the episode is easy to see coming from about half-way through. 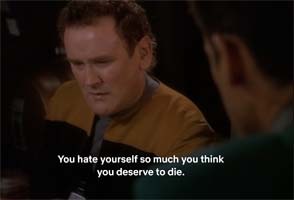 And Voyager sometimes borrows plot threads from DS9, such as "Mortal Coil" (DS9's "Hard Time"). Then we have the fact that the Borg show up again, only to be over-utilized and become conceptually gutted as a villain. 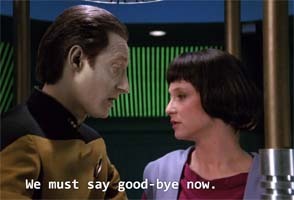 Even Q comes back in Voyager. 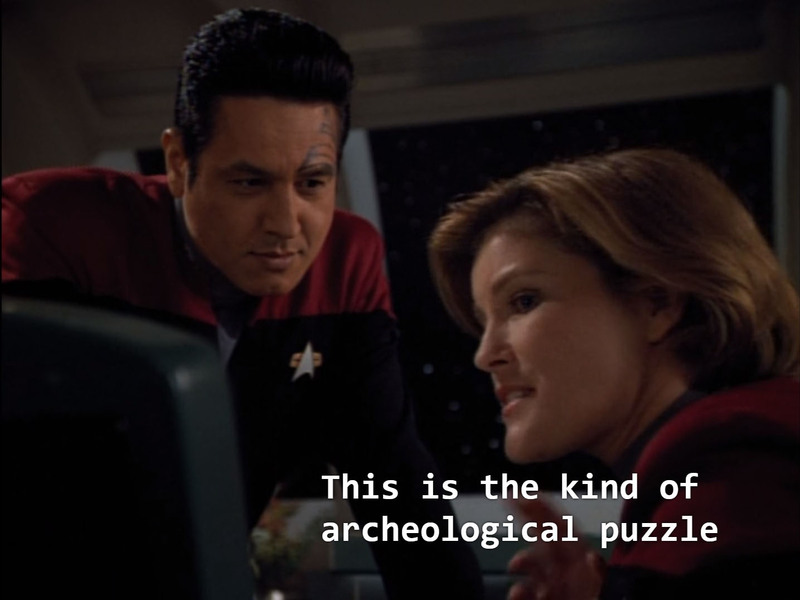 Granted, he showed up in an episode of Deep Space Nine as well, but a big part of that DS9 episode was about highlighting how different DS9 (and its characters) is compared to TNG. This is exemplified by Q's quote "You hit me! 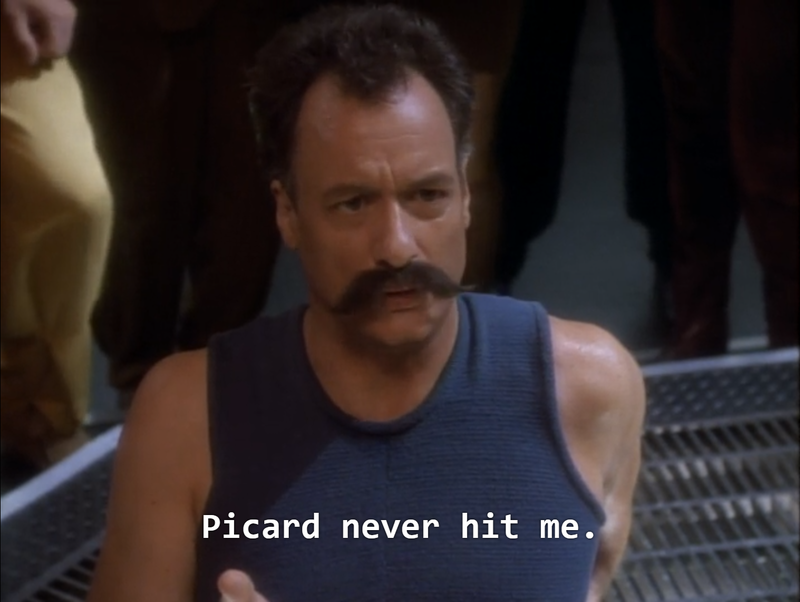 Picard never hit me!" 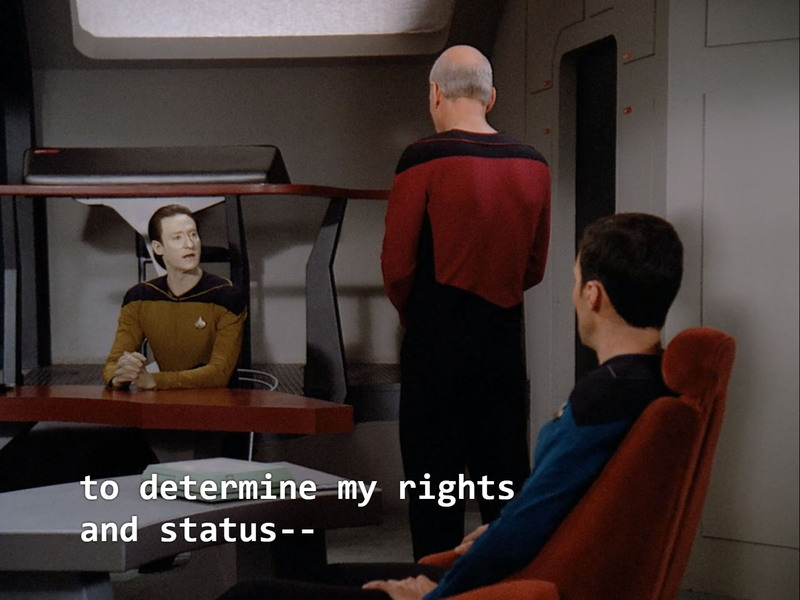 and Sisko's response "I'm not Picard." 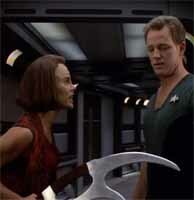 I do have to say that I think "Death Wish" is one of Voyager's strongest episodes. It is thoughtful and provocative, making an allegory about euthenasia and quality of life completely dissimilar to episodes like "Ethics", "Life Support", and "Mortal Coil", while also being a bit deconstructionist about the Q and their lives of immortal omnipotence. 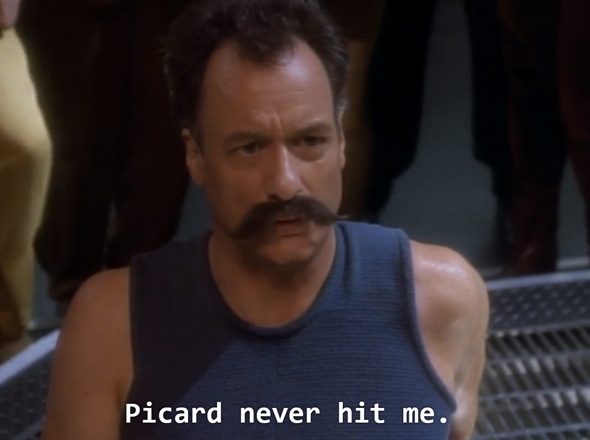 "Death Wish" explores the Q in ways that TNG never did. 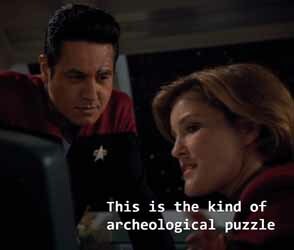 All that being said, by the time of "The Q and the Gray", it's kind of just Q up to his old antics again, replacing his bromance with Picard with an attempted literal romance with Janeway, then "Q2", which is just Q Junior going through the same trials as his dad did in "Deja Q" (being stripped of powers and everything). Q's brief appearance on DS9 served to highlight just how different these new characters are. Homage? Or indulgent fan fiction? 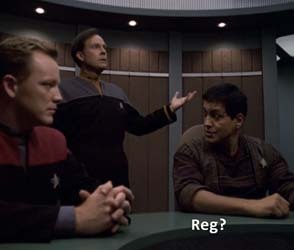 And then of course, other minor characters from TNG show up as well, including Reginald Barclay and Boothby. If they wanted to bring in a guest character, why not have Chakotay's boxing instructor be Kurzon Dax (or someone like that) instead? And it wasn't just TNG that would be ripped off by Voyager. Plenty of Voyager's stories also seem inspired by DS9 episodes. An episode from Voyager's third season named "Warlord" seems awfully similar to a first-season DS9 episode called "The Passenger". In the former, a dying tyrant transfers his consciousness into the body of Kes and then proceeds with his plans to retake control of a government that had deposed him. In the later, a dying terrorist transfers his consciousness to the body of Dr. Bashir, who proceeds to carry out a plan to hijack a weapon of mass destruction being shipped through the station. Sound familiar? Are these examples of Voyager's writers pilfering the previous series(s) for cheap weekly story ideas? 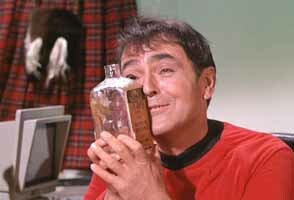 Or are they simply trying to pay homage to previous Trek stories? 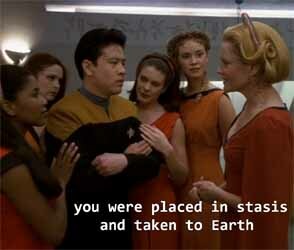 Either way, Voyager almost starts coming off as lazy, indulgent fan fiction. 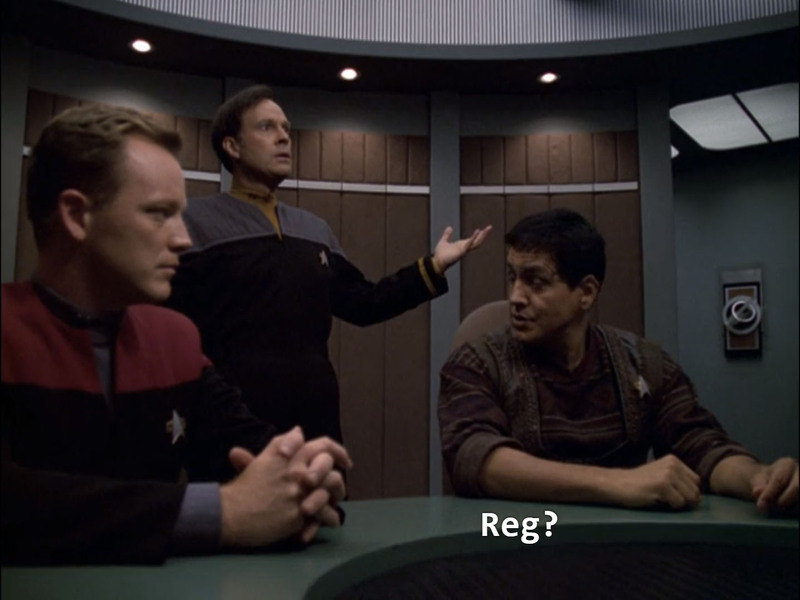 Voyager dredges up TNG guest characters like Boothby and Barclay. In a franchise with as many installments as Star Trek (636 as of the end of Voyager, including the movies and animated series), you should expect that many concepts and plots will repeat. The episodes referenced in this section aren't bad episodes, necessarily. 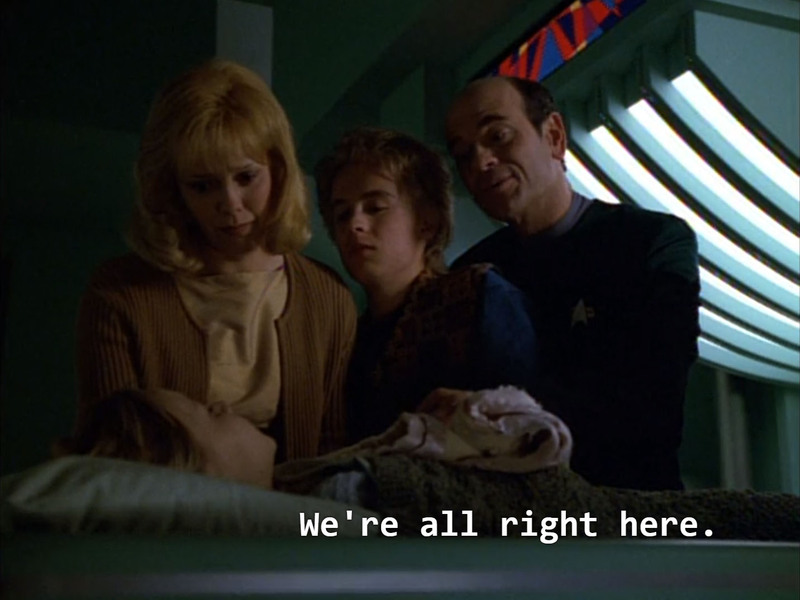 In fact, "Real Life", "Author, Author" and "Mortal Coil" are among my favorite Voyager episodes. 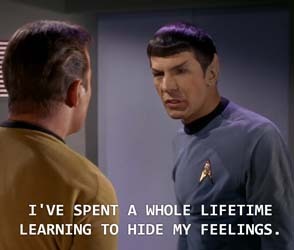 Heck, "Real Life" and "Mortal Coil" might even make my short list of favorite Star Trek episodes (regardless of series)! Nevertheless, there's a definitive feeling of "been there, done that" with these episodes, among many others. 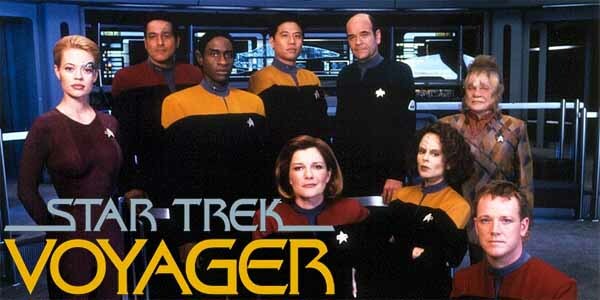 There are, however, a lot of people who really like Voyager as a series. From my experience, most of these are people for whom Voyager was the first Star Trek show that they regularly watched. In that context, their fondness for the series, and their imperception of some of the show's faults makes a lot of sense. If Voyager was your first Star Trek, then it makes sense that you wouldn't notice when characters and story concepts feel derivative from the earlier shows, since you're not familiar with the sources from which they are derived. 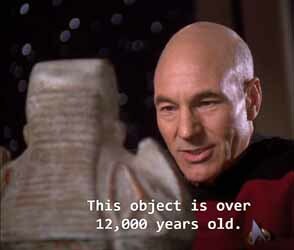 Without having seen TNG or DS9, it's understandable you wouldn't notice similarities. 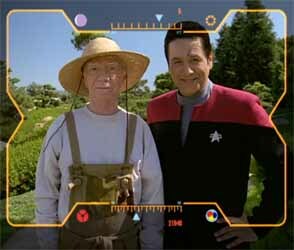 If you hadn't yet seen TNG, then it makes sense that you might not recognize the Doctor as being derivative of Data, nor would you recognize that some of his episodes are just re-hashes of Data stories. 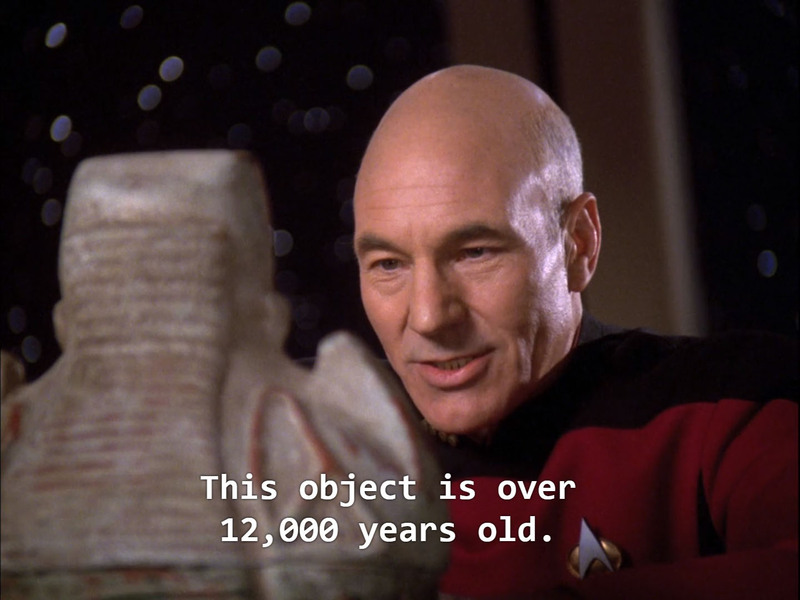 You won't notice that "Real Life" is a re-hash of TNG's "The Offspring", or that "Author, Author" is a re-hash of TNG's "The Measure of a Man". 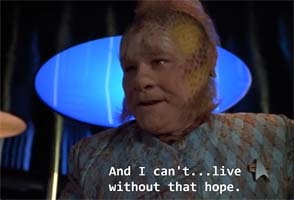 If you hadn't watched TNG or DS9, you probably won't see Neelix as being derivative of Guinan and Quark. All three have similar roles as bartenders / cooks who provide advice and moral support, and Neelix and Quark are particularly similar in that they both frequently act as comic relief characters -- though Quark is a much more cleverly-written and performed foil for the other characters. You probably also won't see Kes as being a rehash of Wesley Crusher the wunderkind, or Torress as a rehash of Worf the Klingon struggling with his aggression on a ship full of pacifists, and so on. Even then, the show still suffers from some failings in its writing. 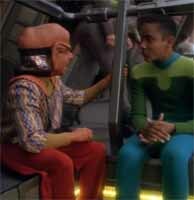 A friend of mine also recently re-watched Voyager, and he pointed out to me an observation (which also served as one of the other impetuses for writing this review) that all too many Voyager episodes follow a very similar story pattern: Voyager encounters an alien race, but some secret or mystery of that alien culture puts the crew at risk. 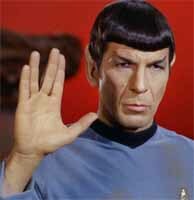 Star Trek has a long history of "aliens of the week" with some narrative gimmick that creates drama. 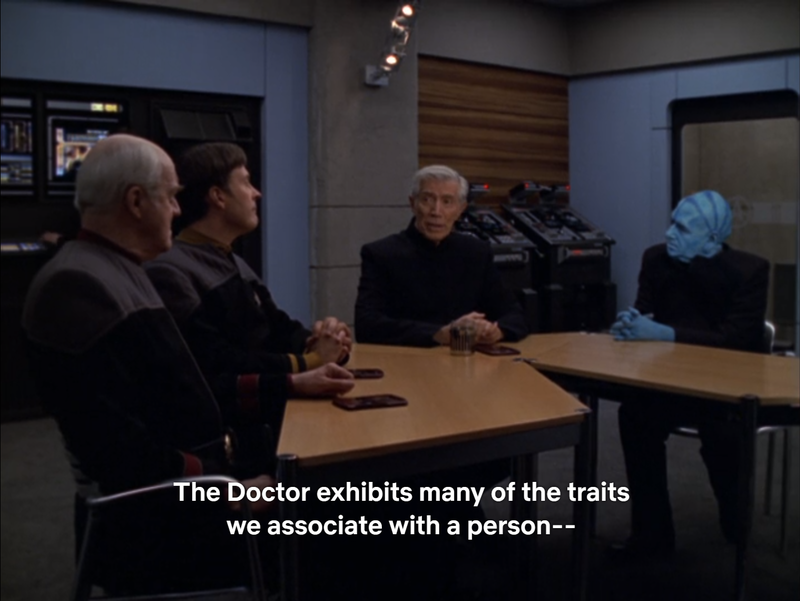 Prominent examples include TNG's "Justice", "Symbiosis", "When the Bough Breaks", and "Half a Life". 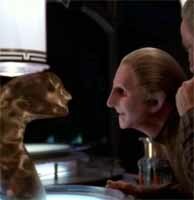 Similar DS9 episodes include "Move Along Home", "Armageddon Game", and [maybe] "Children of Time". Voyager also repeats the same story idea of "alien of the week" with a twisted secret. While TNG and (especially) DS9 focused on character-driven plots (even within their gimmicky "alien of the week" episodes), Voyager too often relied on "alien of the week" gimmicks as the only real driving force of its stories. Again, these storylines aren't necessarily bad. Some of these are good stand-alone episodes, and some of the concepts are interesting ideas for a science fiction show to ponder. I particularly like "Unity", for instance, for being one of the few Borg-centric Voyager episodes that explores the Borg in an interesting and provocative way, by actually making an argument in favor of the Borg collective consciousness. "Tsunkatse" is also notable for being one of the earliest [non-wrestling] acting gigs for Dwayne "the Rock" Johnson. However, even if the episodes are independently good, the twists eventually become easy to see coming from a mile away, and the stories become predictable and rote -- especially if you are already familiar with these same story archetypes from the earlier series. 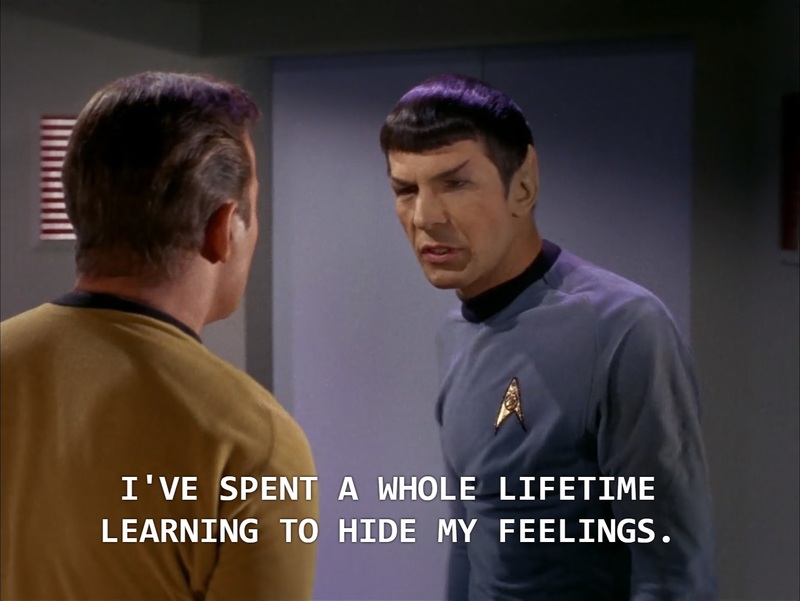 But we're not done criticizing Voyager yet. 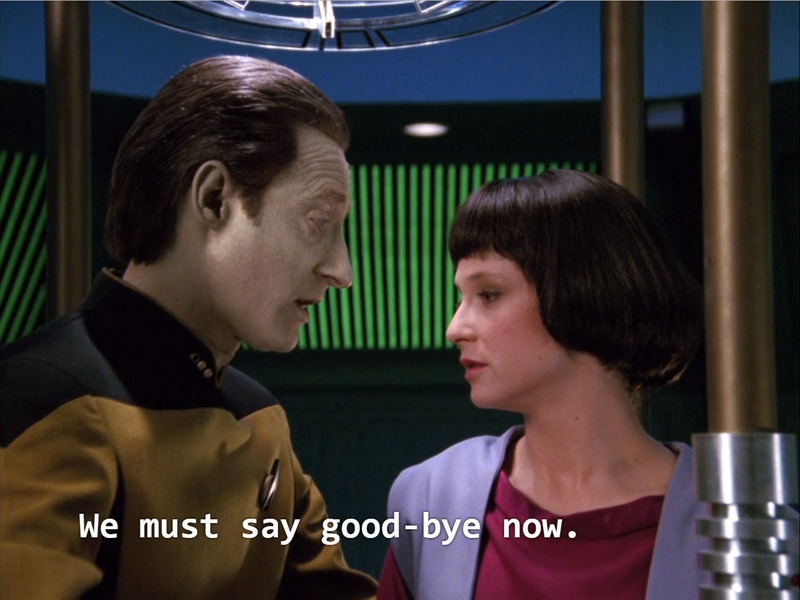 In my third and [probably] final post in this series of Voyager criticisms, I will be talking about the thing that I most despise about the series: its god-awful ending. And we'll be talking about how the series could should have ended. Hope to see you there!